I am often asked, which are the best bits of Ireland to visit? Which are the greenest? The most ‘Irish’ ? This is all very subjective, of course, but what most people don’t know is that the European Union has come up with a pretty efficient way of mapping some of the most sustainable regions of Europe. It has chosen Eden areas all over Europe, and Ireland boasts five of them. Because EDEN is an acronym meaning EU Destinations of Excellence, and are actually awards given to specific regions (often tiny enough to fall off the usual tourist maps) for their exemplary contributions to sustainable tourism. And I have the task of going in search of all of Ireland’s EDEN’s to see if they are as fruitful as they claim to be. The more well known Eden, as in ‘Garden of’, means fruitful and well watered, and as I went on my way around the EU’s five ‘chosen ones’ in Ireland, namely Clonakilty in County Cork, Sheep’s Head Peninsula also in County Cork, Carlingford and Cooley Peninsula in County Louth, Mulranny and The Great Western Greenway in County Mayo, and my first stop, Loop Head Peninsula in County Clare, I found landscapes that bore fruit which would tempt any visitor into a state of desire. A desire to stay longer, meet more of the people, consume more of the food and drink, walk more of the land and celebrate even more of its endless waterscapes. And yet none of it is forbidden. Unknown by many tourists, perhaps, but the doors are wide open. I am starting in County Clare’s Loop Head, which is certainly watered, if not by all the rain it has had over the last year, then by the waves which crash into its northern Atlantic shores. 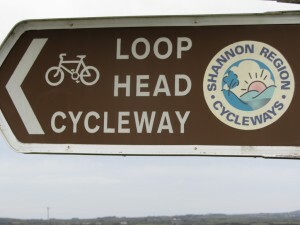 It doesn’t put me off taking on the Loop Head Cycleway, which goes around the whole peninsula, top to toe, and at 65kms takes about two days to complete, at tourist speed that is, not racing speed. I decide to take it easy and spend three days looping the loop and it turns out to be a good decision. Especially because at some points the signs go a little awry and I need to get back on track. However you can’t get too lost here, as you have sea either on your right or your left at some stage. The problem with taking on a long loop type of break is finding places to stay, but with Loop Head Tourism Group forming a tightly knit community, I soon have a chain of beds to fall into every night. The Cycleway starts and ends in Kilkee where there are also, somewhat divinely (it is Eden after all) some seaweed baths and a seawater treatment centre at The Kilkee Thalassotherapy Centre. The Centre also has accommodation, so I book in here for my last night, knowing that if it pours the whole way round the Head, I would have that image to keep me going. I leave my car at the Centre, where the wonderfully helpful owner, Eileen Mulcahy, also arranges for a hire bike to be delivered. I set out along the North coast of the peninsula, my target for today the lighthouse at the tip, and within minutes of cycling along this quiet road, my eyes are drawn back towards the headlands which tumble out behind me along the West coast. 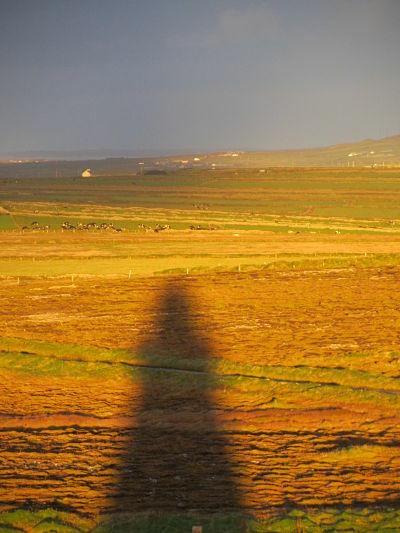 The furthermost was the Cliffs of Moher, and the closest the cliffs at St. George’s Head in Kilkee itself, rising majestically above the perfect curves of its strand. 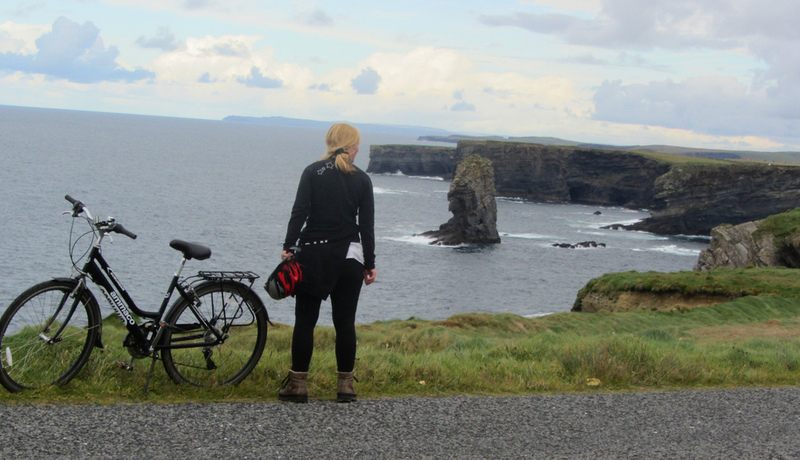 And there are a load of them holding up my cycle route too, but I keep the head down and don’t veer anywhere near the edge, gaping and gasping at the dramatic rock stacks and blow holes which line my route, and yet miles away from the crowds of Moher. The Cycleway clings to the coast for about 9kms with virtually no cars passing me along the route, and there are plenty of long straight stretches albeit with a few gentle ups and downs, so that you can see and be seen well ahead. It then turns inland to more shaded roads, lined with hedgerows bursting with blackberries which I could almost pick en passant they were so enormous. Nothing forbidden about these either. I stop at Cross, a further 7kms inland, where I drop my bag at a recently converted schoolhouse, my first bed for the night. I had hoped to book into the Landmark Trust’s Lighthouse Keeper’s House at the tip, but they book out months in advance, and this elegant conversion of The Old School, proves to be the most cosy and ideally located spot for the night anyway. And with the most congenial hosts too, Teresa and Ian Glendinning, who have rescued this old stone building with love and more love, and must relish the smiles that their guests give back when they see the fruit of their labour. They certainly have their own special little corner of Eden here and not even having had a chance to create their own website yet, they will be sure to book out when they do, so get in quick (Tel: 065 6703666 ). There was still enough time to get to the lighthouse for sunset and, with a lighter load, I grab a quick snack in Foley’s shop in the Cross Village to get me through the last 12K of the day. About 3kms outside Cross there is a fork in the road, which I nearly miss, but the cycle route veers down a quieter lane to the shore again, to the magnificent Bridges of Ross – a series of natural stone bridges sticking out into the sea like giant fingers. You can easily miss them if you are speeding past, although the call of the many Kittiwakes, Guillemots, Shearwaters and Terns which make these wonders of natural architecture their home will lead you in the right direction. It’s bit of a gradual uphill cycle from here to the tip although the lighthouse, which remains hidden throughout the cycle, revealing itself only on the last 2kms stretch, as it glows in the most incredible sunset, which had also been concealed by the cliffs until the last minute. 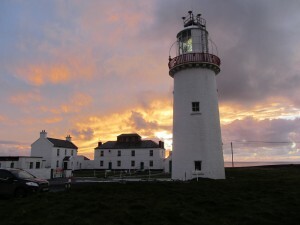 This lighthouse opened up to the public this year, for summer months only, and has a small exhibition and touching DVD with lighthouse keepers sharing anecdotes, as well as a tour up to the top, where I was able to look back along the route I had just cycled. Seafood chowder at nearby Keatings Pub in Kilbaha, overlooking the southward facing side of the tip, with its view over the Shannon this time, was made even more palatable by the fact that Ian, at the School House, had offered to pick me and my bike up after dinner. So, you are safe to have one or two for the road. Similarly, he dropped me back at the tip in the morning, so that I could continue where I left off, my School House packed lunch tucked into my pannier. My aim for today is to get to Carrigaholt for 11am to join a Dolphinwatch trip on board Draíocht, to try and spot some of the 140 dolphins living on the rich stocks of herring and mackerel in the river mouth. I am not disappointed, as within minutes we spot dancing in the distance and Geoff, the skipper and highly knowledgeable guide, switches off an engine to let them approach slowly. The group on board all instinctively lower their voices to let these wild animals approach in peace, our hearts soaring as they circle around us playfully. The views of Sheep’s Head are superb from the boat as well, as we see the stratified rock formations, arches and caves up close, and looking south where the peaks of Mount Brandon and even Carrauntoohil glisten in the distance. After a symphony of seafood at award-winning The Long Dock in Carrigaholt, I think my day can’t get any better, until I pull into my last stop of the day at Pure Camping in Querrin, a further 8kms up the coast. I catch the end of their season, but have been reassured they have bell tents with wood-burning stoves inside, so I know I will be cosy enough. What I didn’t know was that they have a home made sauna too, which you crawl into through a small tunnel, igloo style, except this one is boiling. After a long sauna, followed by a quick solar powered shower, I run across the field to my proper bed, the fire already set by my lovely hosts, Kevin and Trea Heap, the eco heroes who created this gorgeous campsite, and fall asleep to the sound of canvas gently ruffling in the wind. Querrin to Kilkee is my last lap, about 10kms on tiny back roads which have seen nothing more than tractors and cows from what I can see. That and a lot of birdlife which wade in the wetlands of Poulnasherry Bay. 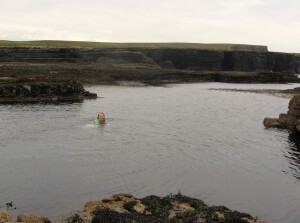 I do a bit of wading myself in the famous Pollock Holes back in Kilkee, natural rock pools which you can swim in at low tide. So put your togs in your bag, as you don’t want to miss these treats, which must be one of the best wild swimming spots in Ireland. And you have the Diamond Rocks café just beside you to warm you up, where other swimmers welcome you to ‘the club’. I jump from cold sea to hot sea within a five minute cycle, as I phone Eileen at the Thalassotherapy Centre, who has the steaming seawater laced with seaweed waiting for me. This isn’t Eden at all, I think to myself as I sink into my bladderwrack bliss, this is heaven itself. 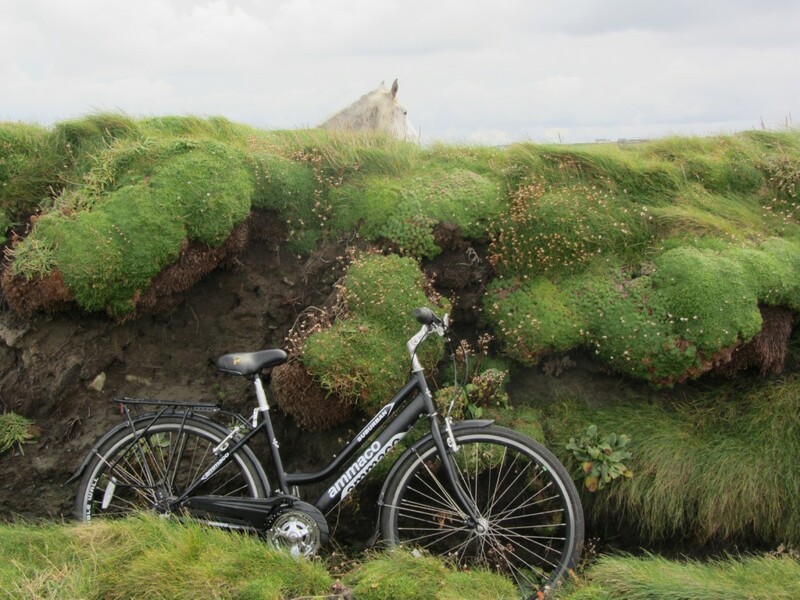 This entry was posted in Articles and tagged best cycles Ireland, Best walks ireland, cycle routes Ireland, dolphin watching Ireland, Eden Ireland, family friendly Ireland, Gathering, green holidays Ireland, hiking Ireland, Loop Head, remote Ireland, walk Ireland. Bookmark the permalink. Recognise a lot of what is written here. I spent some time on Lop Head, no where near enough as I did it by car. Friendly people and the views are wonderful. 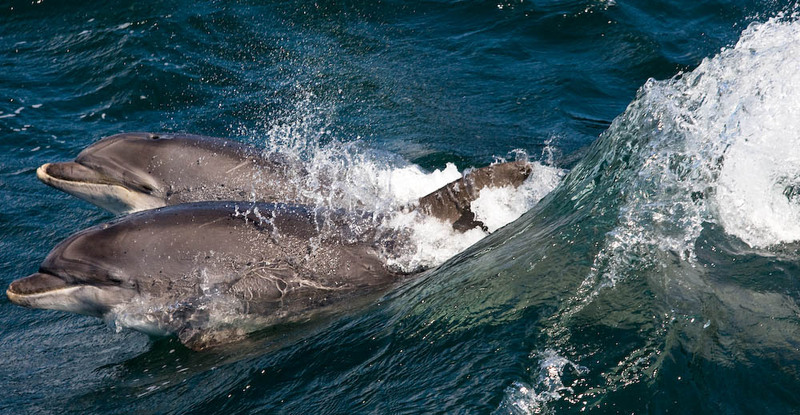 Also did the Dolphin watch and the team are very helpful and ensure you get to see Dolphins, we saw a pod of fifty.